The Genadyne AccuTurn system combines Pressure Relief, Micro Low Air Loss, with Lateral Rotation to promote circulation and accelerate healing while reducing complications of patient immobility (ie: decubitus ulcers, nosocomial pneumonia, circulatory problems, urinary tract infections, etc.) for the homebound and hospitalized patient. The mattress is designed to accommodate all standard hospital beds and can be customized for Bariatric patients as well as any size, home bed frame. 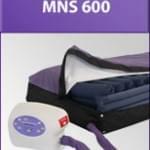 The Genadyne MNS 600 is a full depth (8”) lateral turning mattress replacement system which reduces interface pressure for the treatment of Stage I through Stage IV pressure ulcers. 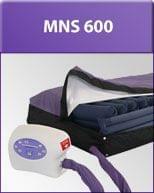 The MNS 600's powerful, lightweight, and easy-to transport power unit inflates the mattress in less than 5 minutes. Caregiver-friendly controls and several valuable user functions -- including Auto-Firm, CPR deflate and simplified patient weight settings -- further enhance the MNS600's advanced therapeutic performance. Detta inlägg skrevs av MNS 600 Alternating Pressure Relief System och har visats 2653 gånger.